Wearing: Vintage blouse, Vivienne Westwood skirt, Dune clutch, Christian Dior boots from TK Maxx, Chanel heart ring, H! by Henry Holland skull ring. This is the third post in my ‘How to Wear Pastels’ series, this time I opted for a less summery look. Why? Because pastels are for life not just spring/summer! That’s right pastels were seen all over the runways flaunting next seasons collections. Bora Aksu chose soft greys to pair with pink which is where I took influence from. I’ve had this vintage blouse for ages in my closet but it is one of those buys that needed to sit and simmer until the right time.┬á I belted it over a pencil skirt to give it a peplum look. Everything else you have seen before except for these killer boot! An insanely lucky find in TK Maxx. I know right DIOR!! I had planned to wear these over London fashion week but rushing to pack I forgot them, I know, I know,┬á I couldn’t believe it either, I even considered having them couriered to my hotel but decided that was a bit diva! They are surprising comfortable thanks to their platform and beautiful foot shape. I really like this skull ring from H! by Henry Holland, I bought it from his first collection. But whatever it is made from does not like my skin it gives me a rash. I┬á heard coating it in clear nail polish might help, anyone tried that trick? I hope you have enjoyed my 3 days of pastels, I am sure I will be wearing much more of the summer so watch this space! Do you have a favourite way to wear pastels? In my opinion there is nothing quite like wearing a big full skirt complete with petti-coat, it makes you feel very ladylike. I have this in red too, bought from Whistles outlet last year. The skirt also has pockets, which I LOVE. If I were a deigner I would make sure everything had pockets! I wore this stunning vintage belt to clash up the outfit a bit, I usually wear it with my big brown Vivienne Westwood belt. I had forgotten about this belt, but was reminded when Judy at Atlantis Home posted about her rock crystal belt and some new ones she had for her store. So, thanks Judy it is nice to be reunited!! 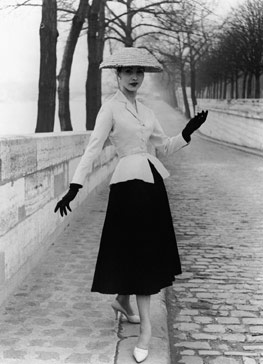 In 1947 Christian Dior set the world on fire when he introduced the ‘New Look’ as Carmel Snow termed it, nipped in waist, below knee hems, full skirt and full bust. Marc Jacobs did the same for A/W 2010 Louis Vuitton, once again embracing the female form. Even on the runway, however this was a tricky look to pull off, but done right it looks sensational. For the launch of the new Flagship London boutique the starlets were out, embracing the collection. But who got it right? Alexa Chung and Kirsten Dunst, both tall and willowy have no problem pulling off the look. Whilst I think Kirsten does it to absolute perfection, Alexa looks slightly to bottom heavey, to her pettite top and waist. Pixie Geldoff and Daisy Lowe are both curvey, the body shape this look was made for, but the cleavage it just too trashy for me. I adore Gemma Arterton, but wish she had worn a lower neck and shorter sleeve, this look can make a big chest look too big and out of proportion. I think she should have switched outfits with Alexa. Pixie would have suited Kirsten’s dress better too, whilst Kirsten, with out the big bust, would have made Pixie’s dress look chic. For me the star of the night was Jerry Hall, leaving the trends for the youngsters she showed true style sticking to a classic look she knows works for her. Will you be trying out this look?